Foreign powers have always found Iraq ungovernable. Britain discovered that in the 1920s. With Winston Churchill's approval, it even used gas bombs against Kurdish tribesmen who would not pay their taxes. The Americans and a new generation of British occupiers are now discovering the old truth. And so is the United Nations. The UN has been in a difficult position in Iraq - one which, if not redefined, may become impossible. It has been subservient to the US and UK and has not restricted itself to humanitarian operations only. If it had, there might not have been an attack. But, using its mandate under Security Council resolution 1483, it has played an advisory role in setting up the Iraqi Governing Council, many of whose members are anti-Saddam veterans. 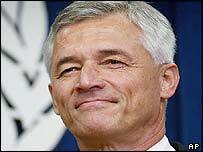 According to Iraq specialist Toby Dodge, Senior Research Fellow at Warwick University, UN envoy Sergio Vieira de Mello himself, who died in Tuesday's bomb, was "clearly associated with the formation of the Iraqi Governing Council. "This helped to make the UN a target," he told BBC News Online. "The attack might also have been intended to block off any American retreat using the UN. This was a potent and diabolical message - that even the UN is unacceptable." The decision has to be taken therefore about whether the UN does more in Iraq or does less. If it does more, it lays itself open to further attack. If it does less, it shows itself to be irrelevant. The British Government is now ready to consider an amendment to the UN mandate in Iraq, according to informed sources. One said that it was "opportune to shake up the kaleidoscope". By this he meant that the concerns of those countries worried about the secondary role of the UN would have to be addressed. UK Foreign Secretary Jack Straw says he is "open minded" on the issue, a diplomatic signal that he is ready for a negotiation. He will be in New York this week on a previously planned visit and hopes to meet Secretary General Kofi Annan. The ambiguous position of the UN has already been the rock on which efforts to bring other countries in as peacekeepers had foundered. India, for one, said that it would not help unless there was a peacekeeping mandate and a strong one. The early indications are that there will be rallying round the UN and that support for a greater role, perhaps one of more equality with the Coalition Provisional Council, will be forthcoming. But it will take time. And it is not certain. "I have always argued that the UN needs to do more in Iraq, and this attack has not changed my mind," Toby Dodge said. "American troops are the focus for resentment and greater internationalisation would help defuse that. "The US lacks experience in nation-building verging on the incompetent. It needs more troops but doesn't have them. "However the roadblock to the UN doing more lies in Washington among the neo-conservatives. Until they accept that it is more attractive for the UN to take more responsibility, nothing will happen," he warned. "In any case, not much will happen before November or December given the way the UN works." And given that the UN is itself a target, there are no easy answers. A former British ambassador to Iraq, Sir John Moberly, said that there should be "more UN, not less". But he also said that the aim should be to speed up the process of handing over power to the Iraqis themselves. "It's been very difficult to bring Iraqis in and we have gone very much for those who came from outside. We've got to think about all the political forces in Iraq," he advised. "The fact of this disaster will make the Americans want to keep the political reins in their own hands, but we should still pursue the main aim of getting Iraqis involved themselves." Sir John, who was on a UN mission to examine the humanitarian situation in Iraq in 1991, also said that there should be a UN peacekeeping force, though he doubted if one could be set up in the near future. The timetable is not encouraging. The Coalition Authority talks about holding elections next year. But that still gives the Iraqi resistance, whether nationalists or Islamists, plenty of time to spread chaos. And chaos is their main weapon. Attacks against foreign troops and contractors, oil pipelines, water mains and electricity pylons lead to destabilisation - out of which they hope to take power. The answer to chaos is not just order. Saddam Hussein ran an "orderly" regime. It did not produce stability. The Coalition's plan is that democratic political activity will gradually lead to stability. But this will not happen quickly - so it is a race against time.